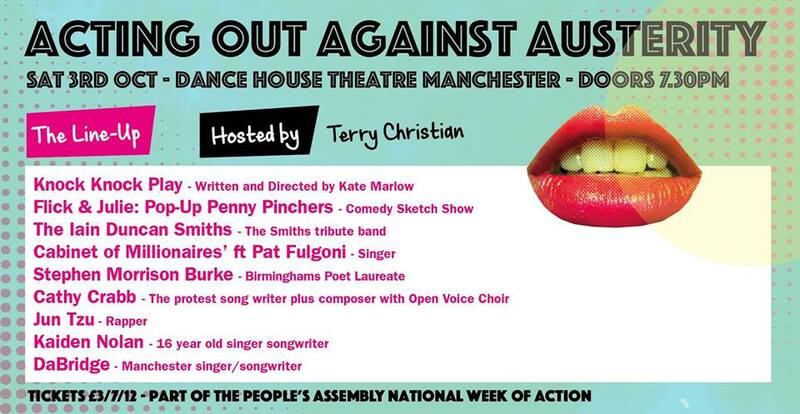 As part of the People's Assembly National Week of Action Against the Conservative Party Conference, there will be a very special evening taking place this Saturday 3rd October at The Dancehouse Theatre, Manchester. A character comedy show of anti austerity sketches and songs ~ helping you to survive in the modern age on 1970's wages. "Poking fun at Cameron's Britain. Consistently ...funny, brilliantly observed & wonderfully performed." (5 star review by Remote Goat). The Birmingham Poet Laureate for 2012/13 and the current poetry National Slam Champion for 2015. When not taking to the stage to perform, Stephen currently works as a Freelance Poet, teaching workshops to youth offenders and young carers. In April 2015 appalled by the prospect of 5 more years of Tory led austerity measures, Pat Fulgoni launched his hard-hitting Cabinet Of Millionaires track which went on to be incorporated into Kate Marlow's play Knock Knock and remixed for other labels. Pat is a singer who has guested on numerous big dance tunes, toured all over the world, written for film & TV and organised many music conferences and showcases.